Venue: Albi Dates: 25 October Kick-off: 14:00 BST Coverage: Updates online, tablets, mobiles and BBC Sport app. 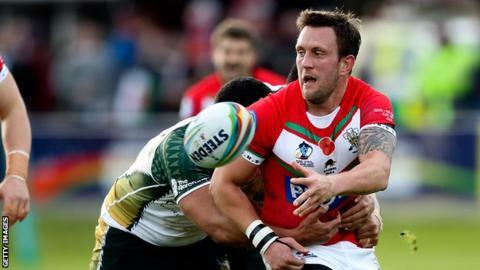 Wales Rugby League have named eight new caps for their European Championship clash with France at Albi on Saturday. The changes come after they went down 42-18 to Scotland in the opening round. And Wales could field their 500th registered player with coach John Kear including four more possible debutants in his 19-man squad. "We had a really good review of the previous performance against Scotland and we've identified areas that we need to tidy up and improve on," Kear said. "The players' application has been first class and if they take that onto the field against France then I'll be very satisfied. "This week will be vastly different to the Scotland game in Cumbria last Friday. We played in a howling gale and driving rain and, from the forecasts we've been getting, we'll have no rain on Saturday, 25 degree sunshine and the ground will be very firm. Kear added: "It's exciting for the game in Wales and we've given a lot of people some opportunities. Some have taken them without a shadow of a doubt and are going to be here for a good few years yet." France coach Richard Agar has made five changes in his 20-man squad for Saturday's 'must win' game against Wales. The French, favourites for the competition, which will see the winners gain a place in the 2016 Four Nations, suffered a shock 22-12 defeat in Ireland last week. France squad: Clement Soubeyras (Carcassone), Jason Baitieri, Julian Bousquet, Damien Cardace, Benjamin Garcia, Antoni Maria, Eloi Pelissier (Dragons Catalans), Kevin Larroyer (Hull KR), John Boudebza, Jamal Fakir (FC Lezignan XIII), Remy Marginet, Frederic Vaccari (Palau), Theo Fages (Salford), Jean-Philippe Baile, Matthias Pala, Mickael Simon (St-Estève XIII Catalan), Tony Gigot, Benjamin Julien (SO Avignon), Aaron Wood (Toulouse Olympique), Aurelien Decarnin (Villeneuve). Wales squad: Dalton Grant (Barrow Raiders), Daniel Fleming (Castleford Tigers), Rhys Williams (Central Queensland Capras), Tom Hughes (Coventry Bears), Matty Barron, Ricky Hough (Gateshead Thunder), Izaak Duffy (Gloucestershire All Golds), Ollie Olds (Ipswich Jets, Australia), Owain Griffiths, Christiaan Roets (both North Wales Crusaders), Yannic Parker (Oxford), Phil Carleton, Paul Emanuelli, Morgan Evans, Connor Farrer, Kyle Scrivens (all South Wales Scorpions), Matty Fozard (St Helens), Lewis Reece (Toowoomba Clydesdales), Peter Lupton (Workington Town, captain).